45% off on my art journaling e-course! Are you curious about intuition and how it works? What if I could show you some simple ways to always be in touch with your intuition? Maybe you have read books about it, but can’t seem to put it together. Are you going to do something about it? Learn how to break through and have some real experiences, not just book learning. Find your inner guidance easily via art journaling. • You never found a simple way to tap into your intuition in a consistent manner, or trust the information you received. • You have been unable to follow through because the lessons or books bored you? • Heart-centered art eludes you? • If you’re a beginner, but eager to learn to tap into your intuition, and quickly. • You feel fears around art journaling or intuition. Imagine making art with an easy flow, straight from your heart! No experience needed. Visionary Art Journaling e-course takes all the mystery out of the art and intuition process. • Unleash your creative side. • Tap into your innermost self and gain confidence in all areas of your life. • Support from me personally online and from other artists in the group. • Experience less stress and worry about the process of art journaling. • A sense of pride and accomplishment for taking steps to deepen your art dream, or even start a dream! • Learn how to create a fun background that fits what you experienced in the meditations. • Learn how to create exceptional details that describe your vision. • How to avoid pitfalls as you move through the art spreads. • Learn about the practical side of interpreting what you feel onto a journal page. • Get your creative juices flowing. • Make new discoveries that inspire you to continue on the journey. Now is the time to get started on your dream to get more deeply into your art! 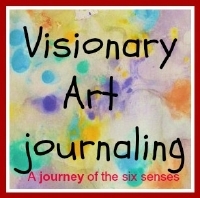 Visionary Art Journaling e-course consists of intro videos, 6 meditation audios, and 6 downloadable art instruction videos with a multitude of examples and suggestions that cover all you need to know about art journaling, and the six senses. All the materials are yours to keep. Again, no experience necessary to follow this e-course. The guided meditation audios are very relaxing and about 7 minutes long each. Bonus videos with more tips on honing your intuition. After finishing the e-course you will have a clear picture on how to put together an art journal spread, using what tools you have. You will have a clear and easy understanding how to access your intuition and how it works. You will feel confident that you can create similar art on your own. You will have a way to keep your inspiration flowing, using your inner senses that never grow stale! JOIN ME FOR AN EXCITING LEARNING EXPERIENCE! This e-course is suitable for beginners and for those who are art journaling veterans. The art journaling pages will provide inspiration to add your own style and imagination. If you like putting in the work up front for better results later, and have fun along the way, this course is definitely for you! This is great for you if you like to take online courses and implement the advice. If you do the work, you will have excellent results. If you are ready and eager to learn this kind of approach to art and see quick results, this e-course is definitely for you. • know where to go next in the art process. It takes all the guesswork out of creating an art journal page. • take the mystery out of the tools used. • plug all the elements into your art via intuition. Follow your dream of exploring art. Seize the day now, learn something new. Get excited again. Allow your talent to shine. Give yourself the gift of creativity. Get re-inspired if you lost the spark. Come along on the journey. P.S. You can check out some of my original art in my etsy shop: HERE.